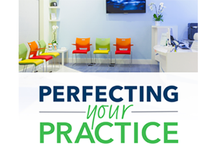 Hey everyone, welcome back to Perfecting your practice. It’s your host again, Keith Gruebele, it has been a pleasure speaking and sharing my insight on the finance area with you all. Thanks again for joining us, again we’re speaking about how from a financial perspective, how you can perfect your practice and how to grow it into the business you want to achieve. We’ve spoken about how to leverage and take control of your finance. 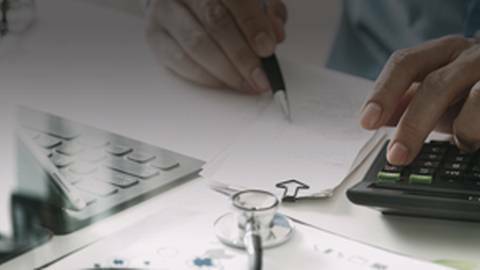 Today, we’ll speak on how to take control of medical business debt that may be lingering over our heads. In healthcare, we have a shorter amount of time to pay off and monetize our debts to prepare for retirement. Why is that? Well, we’re in school for a longer time, so we have a shorter career span. So we have some options — we can either work until whatever age to pay down those debts, or we can make sure were making the right decisions now. Setting up for success from the beginning. Keep in mind, you have a shorter amount of time to monetize your career — so your decisions are more critical than that of most people. You have a much more intense impact on the decisions you make because they’re over a shorter term. Before we continue down the path of doom and gloom about debt I wanted to set the stage. You evolve or become extinct. What were going to do here is evolve your knowledge about debt and your ability to control it. Debt can cause both financial issues and stress related ones. It can lower your credit score, bowering power, insurance and utilities. It becomes a big distracter from your practice. 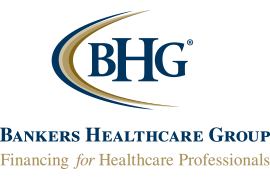 At Bankers Healthcare Group we deal exclusively to healthcare professionals, we often engage the community to learn a little bit more about them. We did a focus group where 20% of healthcare professionals said debt consolidation was their biggest financial need. If debt isn’t addressed you’re talking about delaying your dreams or kind of squandering them a bit. Today we’ll talk about how to not let debt deter you from your dreams. Creating that perfect practice, with as little stress as possible. It’s nearly impossible to start up a practice without taking on debt today, startup loans, marketing, and working capital. A lot of people with those startup loans — do go over budget and that’s because they’re not planning properly. It also costs money to run the day-to-day business. Maintenance, staffing, equipment, or furnishing — all things we need to run the very best practice. Then there’s payroll, you need to ensure you’re paying the best staff for running your perfect practice. Then there are the unexpected things; recently we’ve seen a ton of emergencies that unfortunately, have put businesses on complete halt. Many of which, don’t even have the reserves to get by. Making sure we get ahead of them and control them can give us some pace of mind and clarity. We all know the healthcare professionals tend to carry more than one lien of credit in most cases; the business owner has their credit inquired on 10x more than a non-business owner. That probably means you’re taking on maybe not ten, but multiple liens on your business to keep it running. Obviously, this doesn’t make for an ideal situation; it causes a lot of stress and concern. Carrying a lot of debts can really do a lot of things. Number one, it can cost you a lot more money, that’s the biggest thing. Taking money out of your pocket to pay off other debts. Also, if you have multiple liens out there, they may have different rates, some high, some low. And if we need money in a pinch, we often go for the quickest option, which also may be the most expensive one. By the way, having multiple debts can do a ton more than just cost you money. The stress that comes along with it, dealing with different liens, lenders, dates, rates can be both time consuming and foster a reactionary behavior. Reactionary how? Well if I have payments that come out on the first week or the second week of the month, were always trying to make sure there’s enough in our accounts to balance it all out. You can be stuck always looking for money just to balance out a certain account. Take a look at how to better manage that hassle and get rid of that stress. It doesn’t seem like a stress we all look at, but if you sat down and watched how your account flowed on a daily basis, would give me grey hairs. You really need to take a look at manage that hassle and get rid of that stress and deal with the multiple payments. Sit down and create a better payment plan that can force you to get out of debt. Reacting can make it very hard to plan for your future, you’re looking at a day-to-day basis, rather than being proactive, you’re seeing multiple payments at the same time, it can be tough to build a reserve for emergencies or start investing back into your practice. Look at all the natural disasters in our country, if you got hit, are you reserved for it? It makes it really difficult to do while juggling a lot of debt, to get yourself into a position to manage and prepare yourself for that. 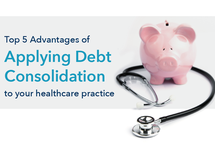 If you’re one of these healthcare professionals, it takes a bet that most are, who have multiple business debt obligations, looking at consolidation can look to solve lots of your issues very quickly and easily. At least, it can force you into making a plan. If you’re selecting a loan that has a fixed term, a set period of time to pay it off in, you can not only pay them off easier, getting your stress levels down, but you’ll also have a fast fixed way to make payments and reduce the cost of leveraging money. Look what you have outstanding. Take a step back and make a plan, if you fail to plan you plan to fail. Take a look at what you have outstanding balances and their interest rates, start and excel spreadsheet, or even just write it down. Record every single payment you make towards a debtor and start listing them all out, understand what they’re costing you, you’ll probably consider consolidating. You’ll probably look at your mail and see an offer from a credit card company, claiming spectacular introductory rates like 0% or 1.99% or whatever, and jump into that. Or there may be an offer for a loan. Well, that 0% offer sounds great and everyone wants to do that, they jump into this saying “it’s 0%, for the next, 6 or 12 months, and I’ll pay it off by then,” but, does that really happen? A lot of times it’s the same game that got you in to trouble to begin with. Or it can be those great point offers, where you want to utilize the points to pay for your vacation. Take a look at the compounding interest over time, or the fact that you didn’t pay off that debt in the 0% time — it can really put you in a tough position. How much did those points really cost with the interest compounding? By the way, when you do balance transfer, you’ve got a fee that you’re going to pay on it. Normally a couple of percentage points added onto your balance, so to start saving money and cutting debt, you’re actually increasing your debt by a couple of percentage points? Something doesn’t feel right there. The reality is that most people who have revolving accounts don’t pay them off in the time they’re supposed to. They carry that debt and revolve it for extended periods of time. That’s one of the reasons banks offer everyone a credit card and every credit card company out there seems to be really profitable. So make sure you know the pros and cons of that. Loans give you the opportunity to pay of the existing balances and potentially lower your interest rate, but overall, lower the time that you have that debt. There’s a lot of different ways to look at finance, and many people simply look at an interest rate and assume that best answer to their problem. Well the lowest interest rate over 30 years, my not equate to higher interest rate over, maybe five, seven, or ten years. You’ve got to look at the total cost of financing, how much it costs to borrow the loan, look at your term, and know how long it will take you to get out of this debt. Does it fall into my financial plan? If you haven’t gotten to your plan yet, take a step back and listen to some of the previous episodes where we cover that plan, starting with an annual then monthly. If your able to set up a term loan and know what your fixed payment is every month, it gives you one a defined payment and period. You can make them at times that are helpful for you, when your cash flow is high, and you’ll at least have that end zone in mind, when it’s all over. Here’s a tip I give some people, when they’re setting it up. Set some reminders for yourself, maybe at the end of the first 12 months, you have a little celebration, take yourself out and congratulate yourself for sticking to your plan, and at 24 months you do it again. Look at how far along you are in breaking down that debt, and celebrate that, because debt is one of those burdens that most people struggle with in this country. And since you’re a healthcare professional and practice owner, it’s even more burdensome for you. Make sure if you’re doing the right things, you’re rewarding yourself along the way for finding good ways to get out of bad situations. Planning for the future can be difficult if you’re dwelling on the past, you can’t move forward if you’re dragging along everything without. Start fresh and cut the line, break the chain of debt, by setting up a plan that gets you to fixed monthly payment over a set term. Once you start putting that together and the fog settles, the stress starts to go away. Worries of juggling money on a month-to-month and week-to-week basis, goes away. Start focusing on that proactive plan, we know what’s ahead of us and we know what that exit strategy is, what can we do with that? Can we pick up a new piece of equipment, start funding your retirement plans, an emergency fund? The possibilities are endless. Setting up that term and seeing that end goal to putting yourself in a better position financially is something that can be one of the most rewarding things in your life. In this episode, learn how to take control of medical business debt. If you have medical business debt lingering over your head, it’s time to take control.